I hesitated to bolt the engine down. It just didn’t feel right. 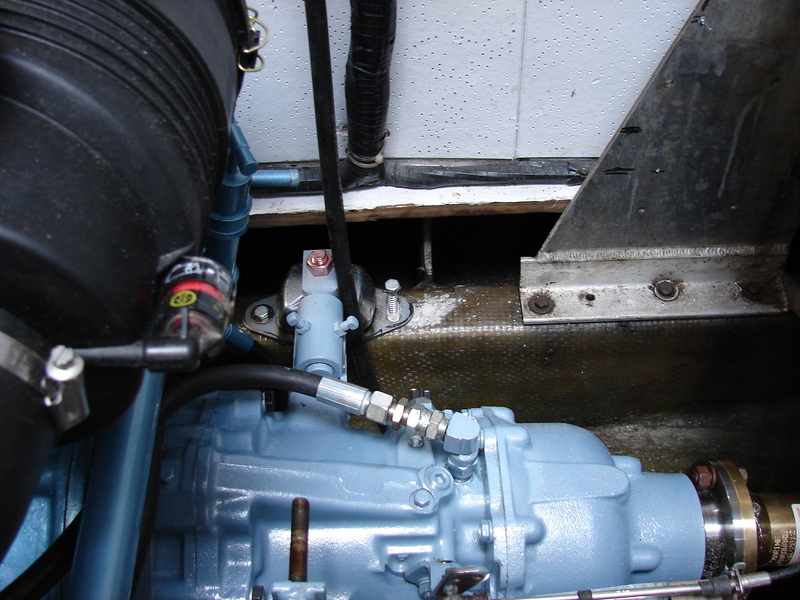 In a boat, the motor rotates the transmission that rotates the shaft that rotates the prop that pushes water aft that pushes the shaft forward that pushes on the transmission that pushes on the motor mounts that makes the boat move. 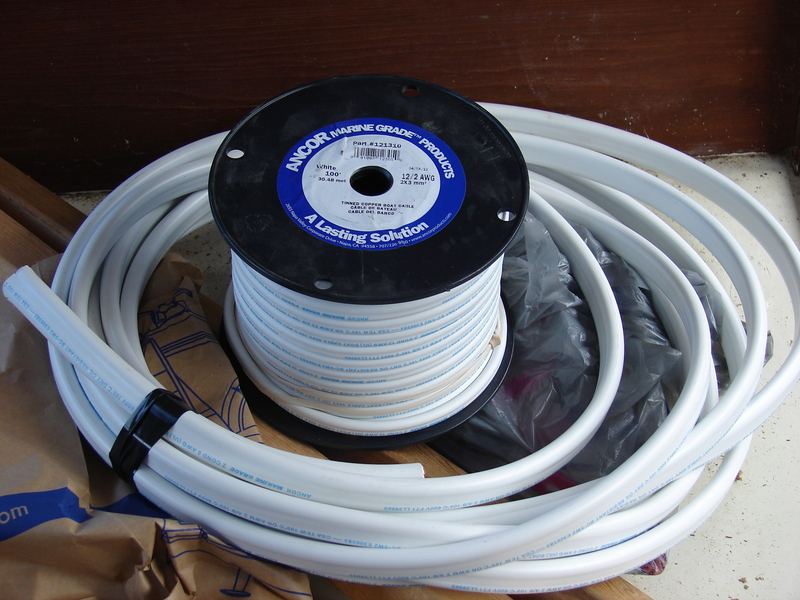 Like all boats this vintage, the motor is attached to steel studs that are attached to rubber isolators that are attached to fiberglass-wrapped wood stringers with lag screws. Lag screws are just big screws with hex heads like bolts. 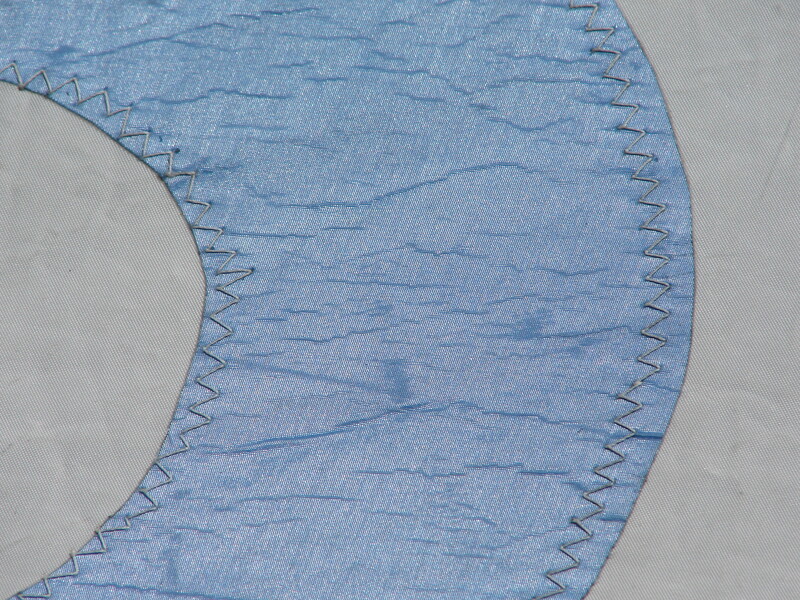 You can see the old fastener hole just to the right of the new fastener. I shifted the engine about two inches forward and repaired the old fastener holes. 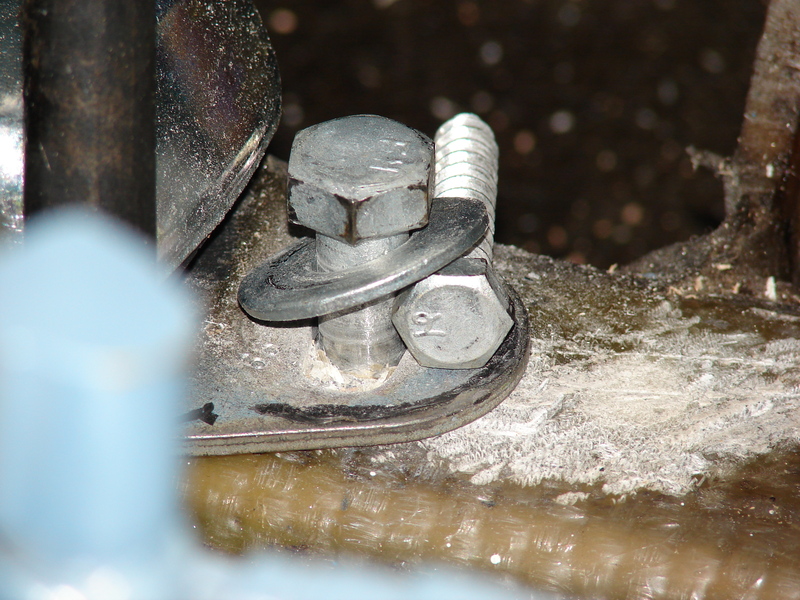 Standard practice is to align the engine, then lag the mounts to the stringers, then adjust the alignment. 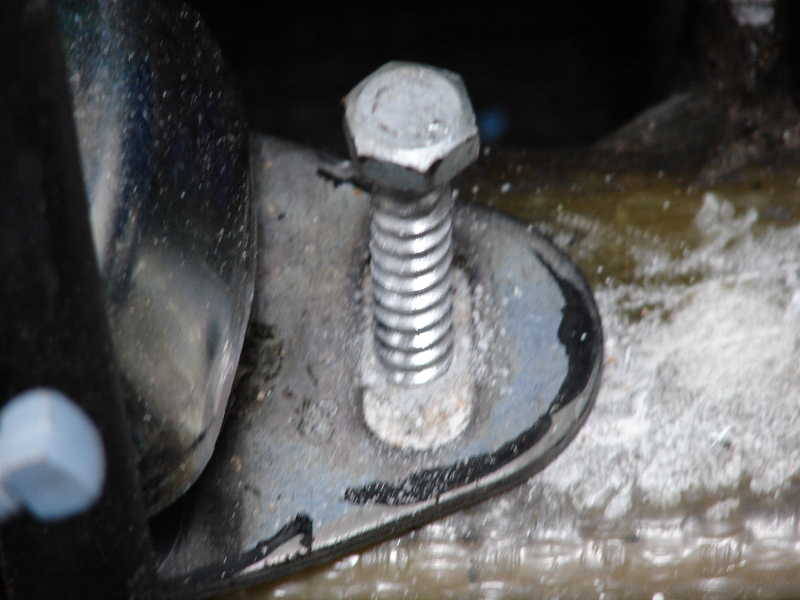 Typically 3/8″ x 3 1/2″ lags are used, so you can adjust the engine position using the slop in the mount holes. I started with 3/8″ lags. You can see how sloppy the whole thing is. When the lag loosens even slightly, the motor can move and lose alignment, causing noise and vibration and the shaft falling out of the boat. I didn’t like it. So I switched to 4 1/2″ long 1/2″ lags in very tight 7/16″ holes. The bolts are tight in the motor mounts and tight in the 5/16″ thick fiberglass wrap around the stringers, so even if they loosen (relax) slightly, the shaft will push on the transmission will push on the mount will push on the stringer and nothing will move. Nothing. Luckily, the preliminary alignment held while I installed the lags, and the engine is now perfectly aligned and very, very solidly mounted. By the way, I used galvanized lags instead of stainless, even though they’re not as pretty. Two reasons: galvanizing sticks to wood like stink, and stainless fasteners don’t belong in tight, potentially wet holes. It’s all about crevice corrosion. Oxide layers and anaerobic conditions. Dude. 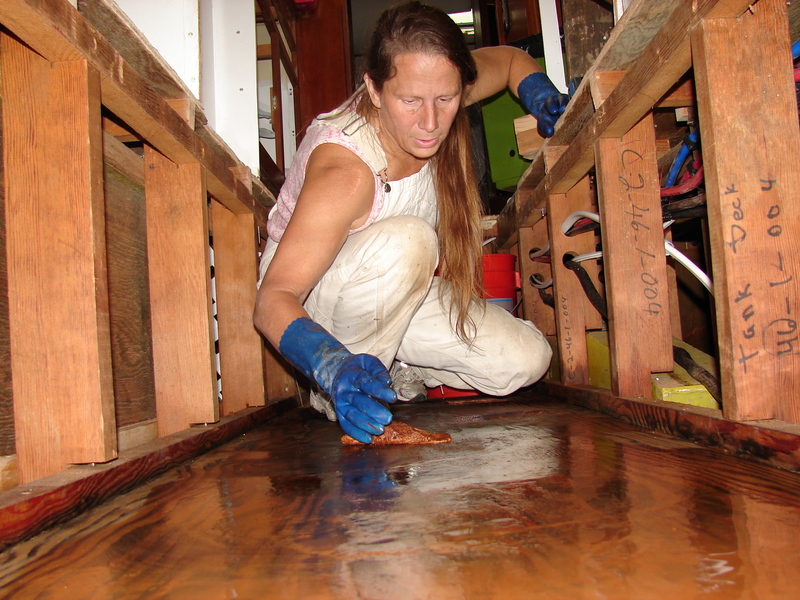 As part of the whole “the inside of the boat should be dry” program, we are removing all the deck hardware and re-installing it with new fasteners and bedding. 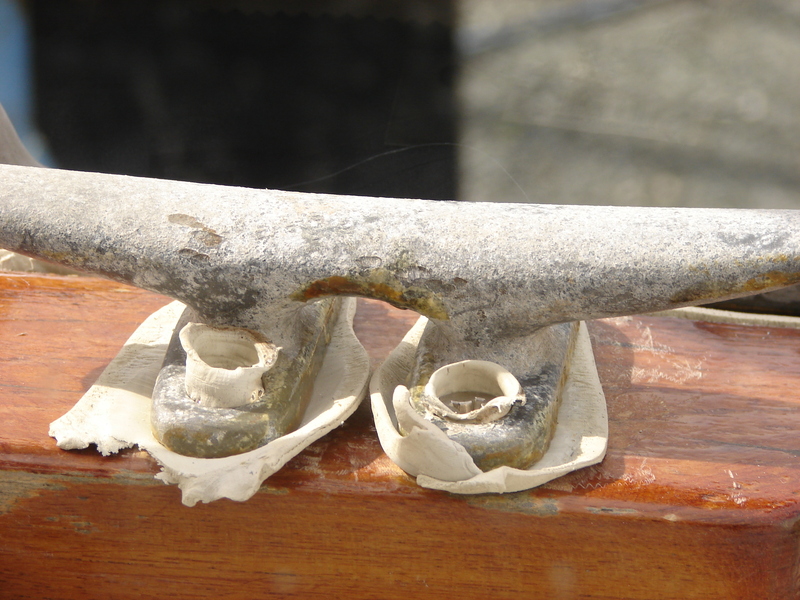 Yesterday we removed the mid-cleat, which is a very important, very highly stressed cleat used often in docking and springing off the dock. We were shocked at how light it was. We assumed it was zinc, a cheap metal used for cheap marine parts and pennies. Zinc, also called Zamac, is weak and fails prematurely. 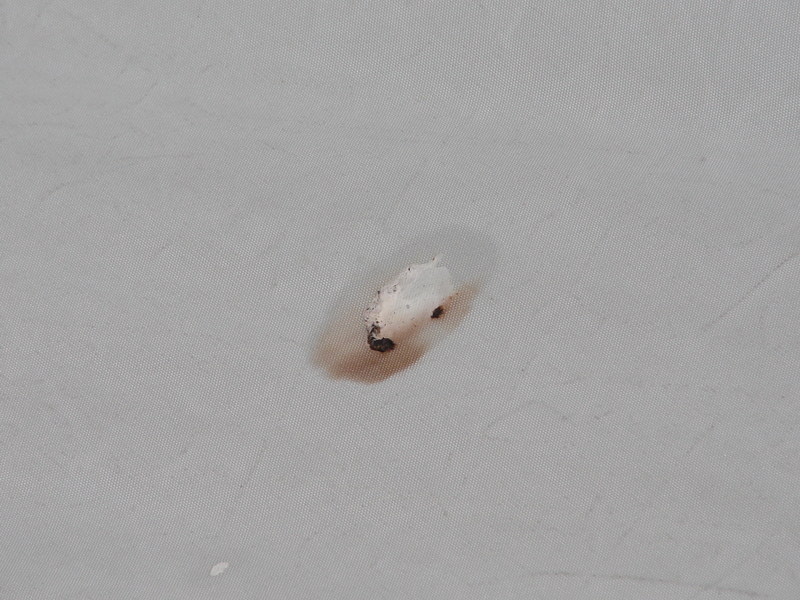 After a little research we found out it was Aluminum, as are most of our cleats. Still not bronze or stainless steel, though, so we were off to Seattle to buy new cleats. Then we remembered that our friend and advisor Capt. 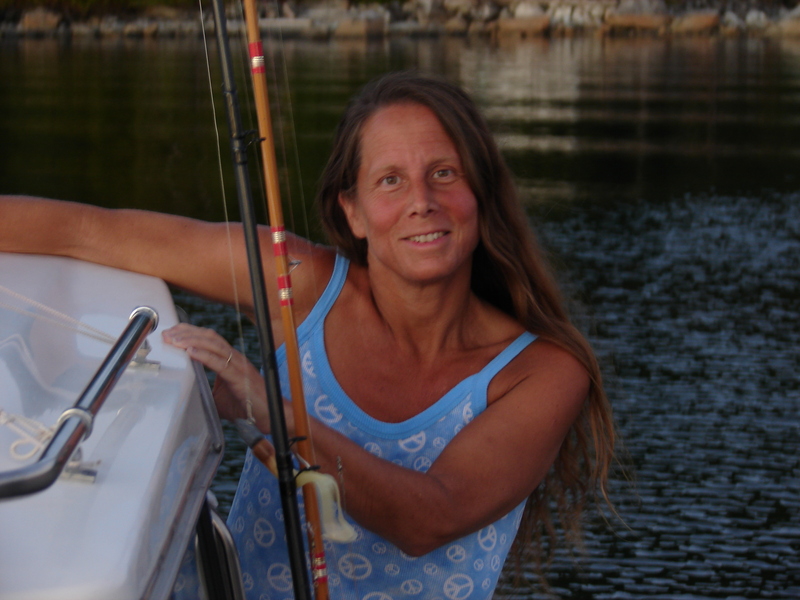 Dean Waterman (http://www.amazon.com/Life-Aboard-La-Cumbre-ebook/dp/B003GDI6PO/ref=sr_1_1?s=digital-text&ie=UTF8&qid=1340939850&sr=1-1) has nothing but aluminum cleats welded to his aluminum boat, and they are plenty, plenty strong. How strong? Read his book. So the cleat went back on the boat. The unstable air in a thunderstorm makes the air and water vapor molecules bang into each other, scrubbing off the electrons and creating a net negative charge in part of the cloud. At the same time, some areas of the surface become positively charged. If the negatively charged area of the cloud becomes connected to the positively charged part of the surface, a lightning bolt is created that carries billions of electrons from high in the cloud. If you’re floating on the huge flat conductive ocean surface in a piece of Tupperware with a metal stick poking way up into the wind, getting hit by lightning is potentially a bad thing. 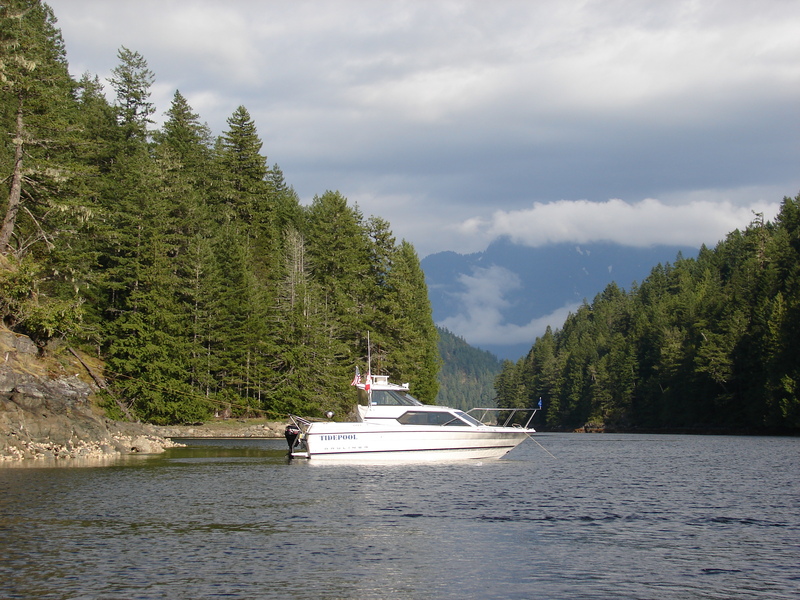 A near miss can wipe out all the electronics, including the GPS and communication gear, while a direct hit can blow holes in the bottom of the boat causing swearing and other negative behaviors. 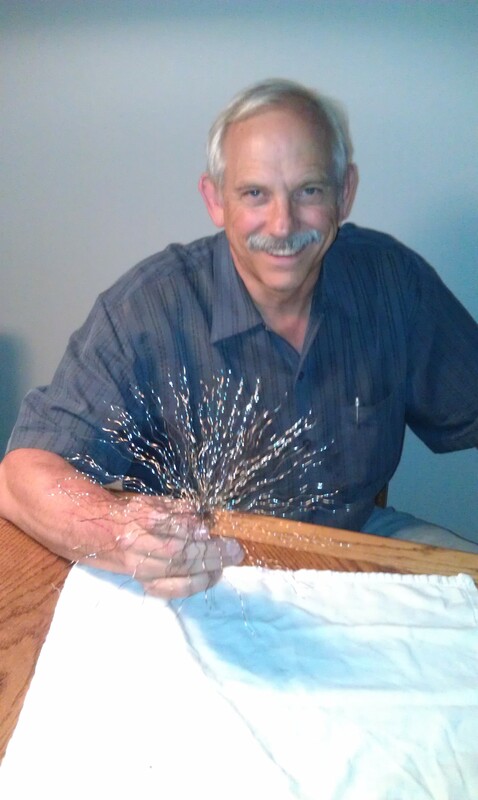 The flower started as a six-inch piece of 7×19 Stainless Steel cable with a copper ring swaged (smashed) on one end. Now it’s a high-tech piece of applied science we’ll bolt on the top of the mast. Each (7×19=133) sharp wire bleeds excess charge into the wind, making the top of our mast exactly the same charge as the surrounding air. It’s like static electricity camouflage. The new shaft is in, the engine is in, and it’s time to install the new cutless bearing. First we disconnected the shaft from the transmission and slid it two feet or so aft. 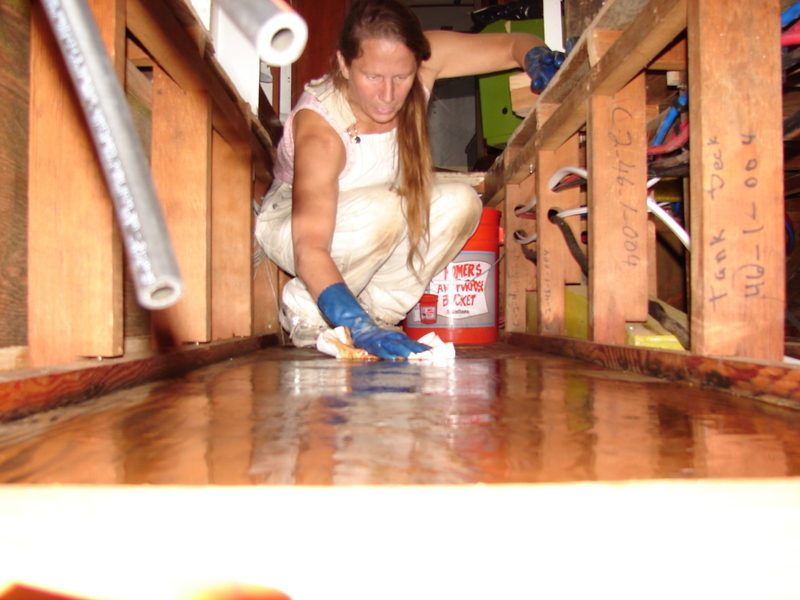 We coated the shaft as far as we could reach with glycerin, then slid it a foot back inside the boat, being very careful to not touch the clean fiberglass/epoxy tube the bearing had to fit into. 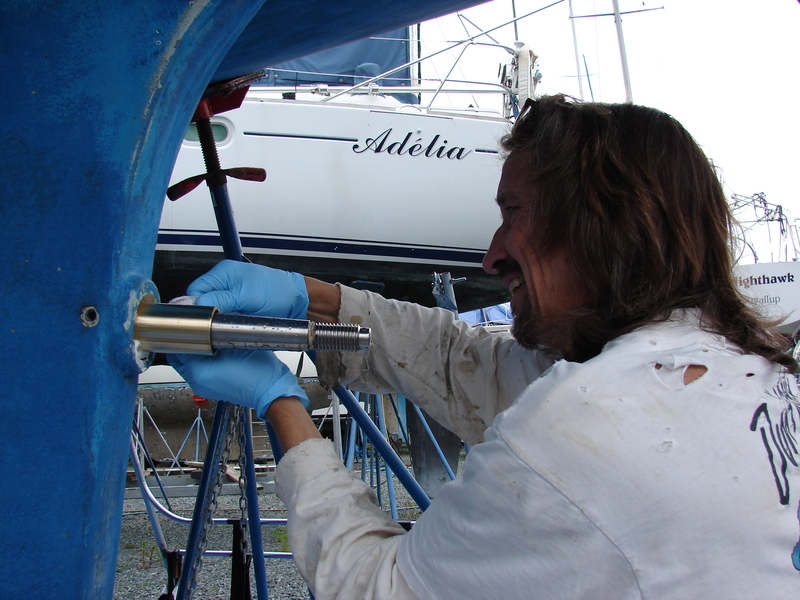 We ran a thick bead of 5200 (edit: should have used a less permanent 4200, BoatLife, or Sika-something) polyurethane caulk/glue around the leading edge of the bearing, and started it into the shaft tube. 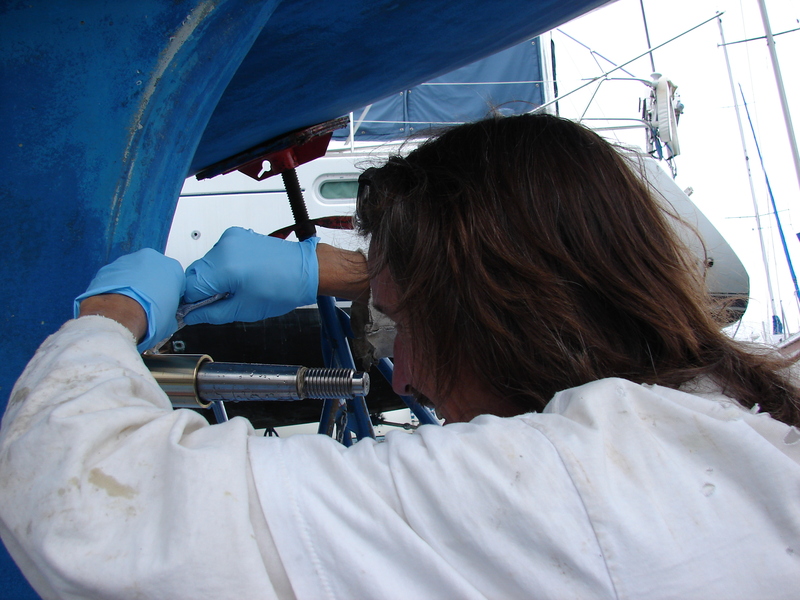 We added more 5200 around the bearing as we pushed it into the boat, maintaining a rotating ring that stuck to the brass and coated the bearing as it entered the tube. The sealant will both center the bearing in the shaft tube and help keep it in place. 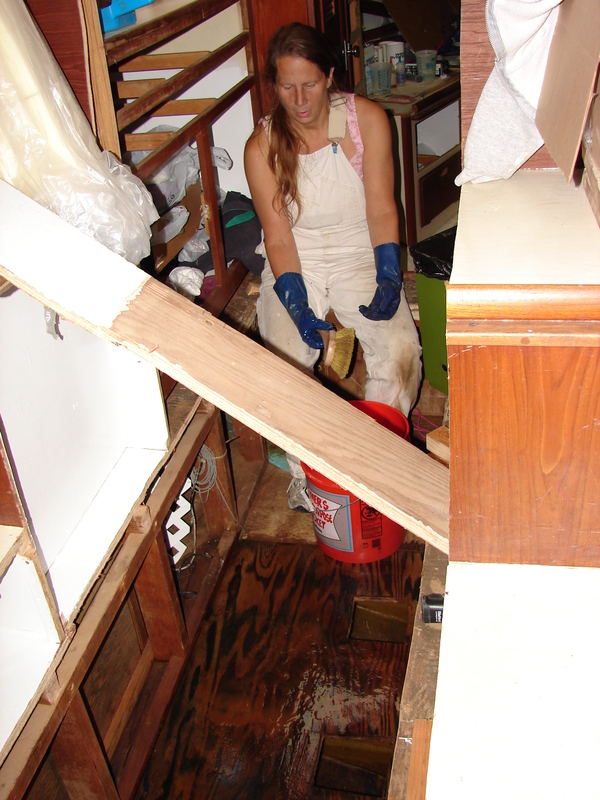 A few taps with the two-pound sledge and the bearing was in. I’d say the fit was about right – tight but smooth. We could hear the bearing seat on the last tap. It rang like a bell. Once the 5200 has set up, we’ll clean up the drips and use a little filler to build up the surface to something nice looking. 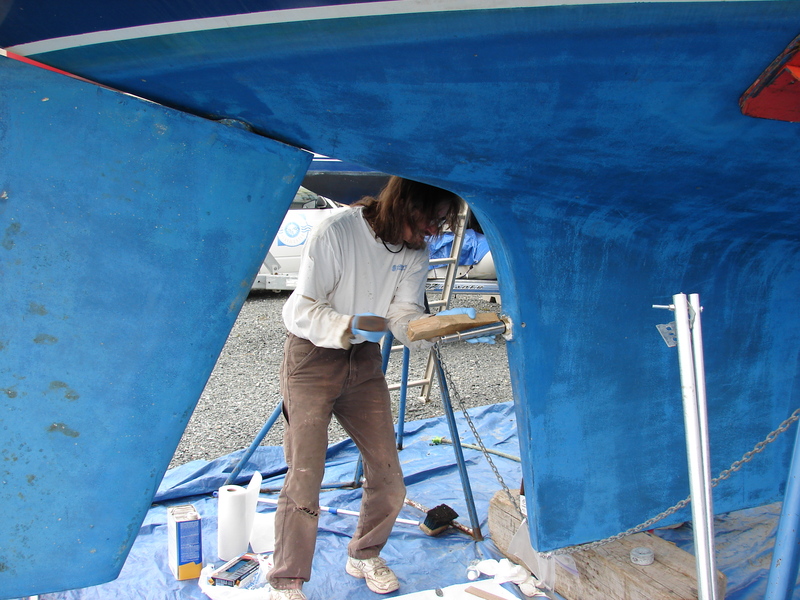 Then we’ll use a drill and put a small conical hole (not thru) in the bearing sides (where the small hole are just forward of the aft end of the keel). We’ll install pointy set screws into the holes, fixing the bearing in place until the next owner feels like working on it. Here’s how we build mattresses on Bright Water. These are the V-Berth mattresses. You can see three layers. The top cream layer is 1.5 inches of memory foam, backed by 2.5 inches of white regular foam. This was cut from a King-size mattress topper bought off overstock.com. The green layer is an extra 2 inches of firm foam bought with a 50% off coupon from Joann Fabrics. We cut out the shapes as best we can using an electric carving knive, then glued the pieces together with 3M 77 spray adhesive – a messy job at best. 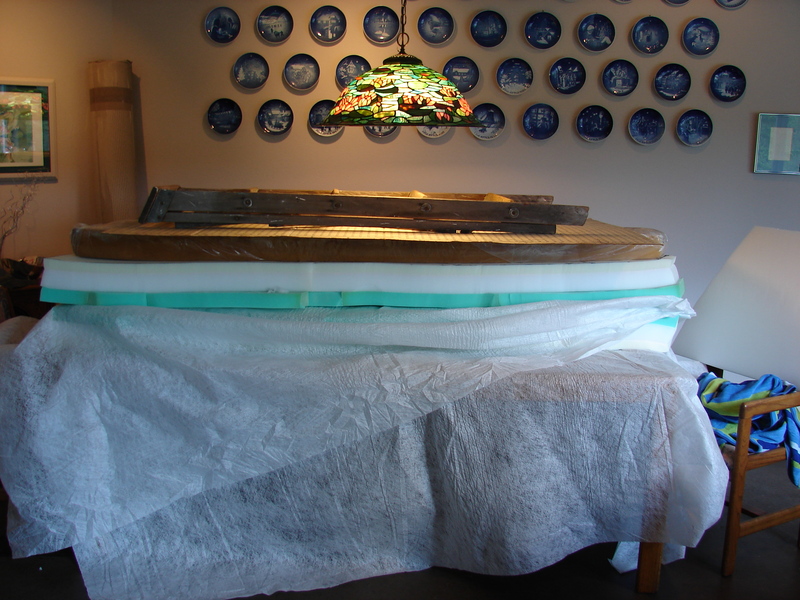 In this case, we stacked everything on top of the dining room table to get the glue to dry flat. Hopefully the old ladder on top is keeping everything compressed. 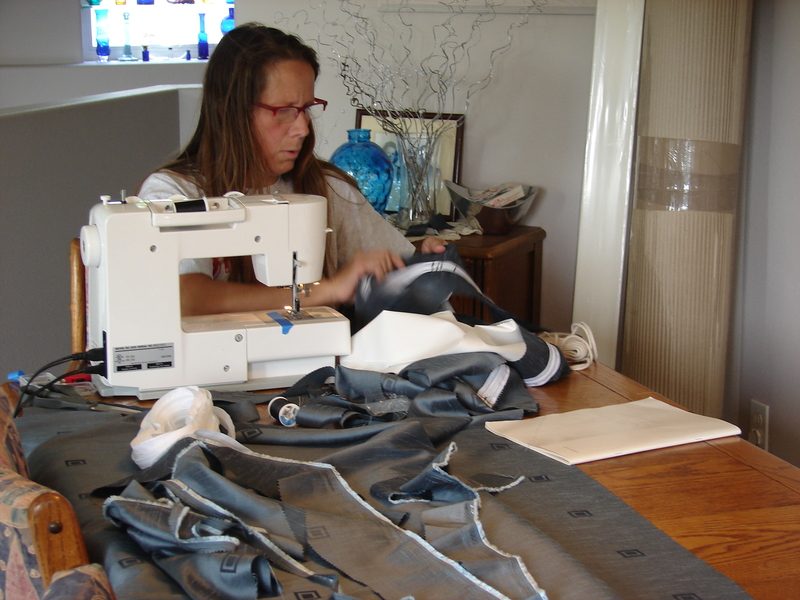 Then Nancy sews a cover and turns the whole thing into a cushion. We’re using 100% Polyester fabric on this boat for durability and easy cleaning. It’s not luxurious, but it’s functional. We figure the beds will be made up or covered with stuff most of the time anyway. Ten years ago, we sailed in the Caribbean for a year. (Shameless plug for historical completeness: http://www.amazon.com/Mermaid-Family-Paradise-Philip-Rink/dp/0972790616/ref=tmm_pap_title_0?ie=UTF8&qid=1341066657&sr=1-1 and http://www.amazon.com/Mermaid-Our-Family-in-Paradise/dp/B0044C3RL4/ref=sr_1_6?s=movies-tv&ie=UTF8&qid=1340423670&sr=1-6&keywords=Mermaid+Family and http://www.amazon.com/Mermaid-Family-Paradise-Philip-Rink/dp/B0041HX7IK/ref=sr_1_23?s=movies-tv&ie=UTF8&qid=1340423760&sr=1-23&keywords=Mermaid+Family). 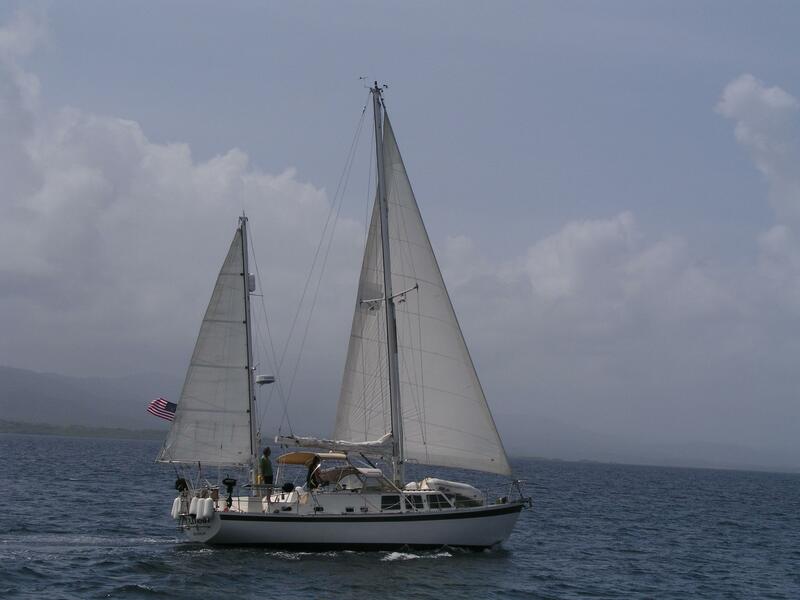 Mermaid was a forty-foot Beneteau Sailboat designed and build for the charter industry. 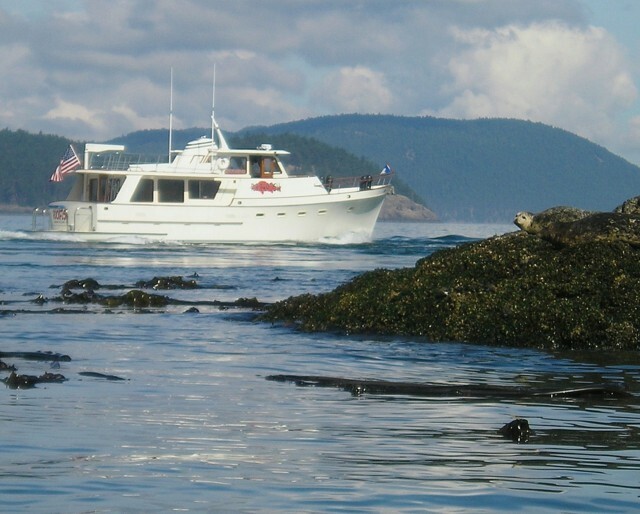 We had a great trip, largely due to the charter-specific features that made the boat comfortable and safe at anchor. She was also a cave. That tiny window to my right was one of four in the main cabin. To look forward or aft, or to look around, you had to go on deck. However, the small windows kept the sun outside, and the cabin mostly cool. 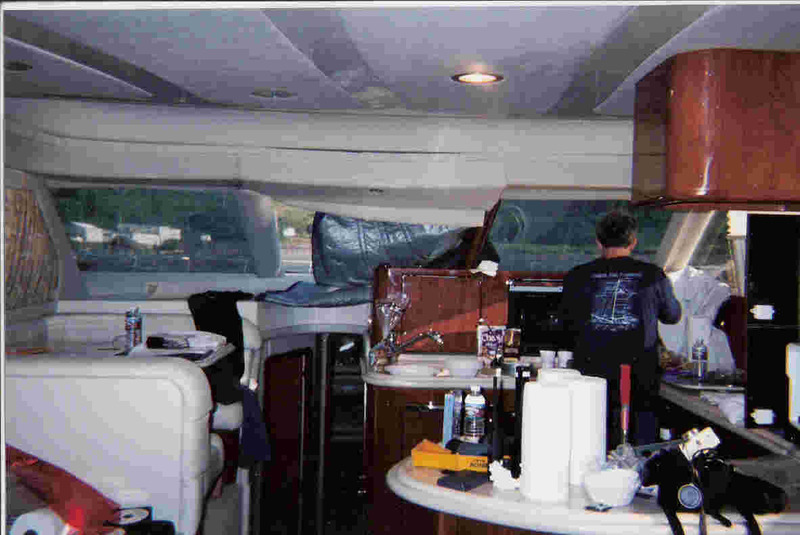 It’s common for sailboats to have few small windows, because the open ocean tends to break whatever you bring to her. 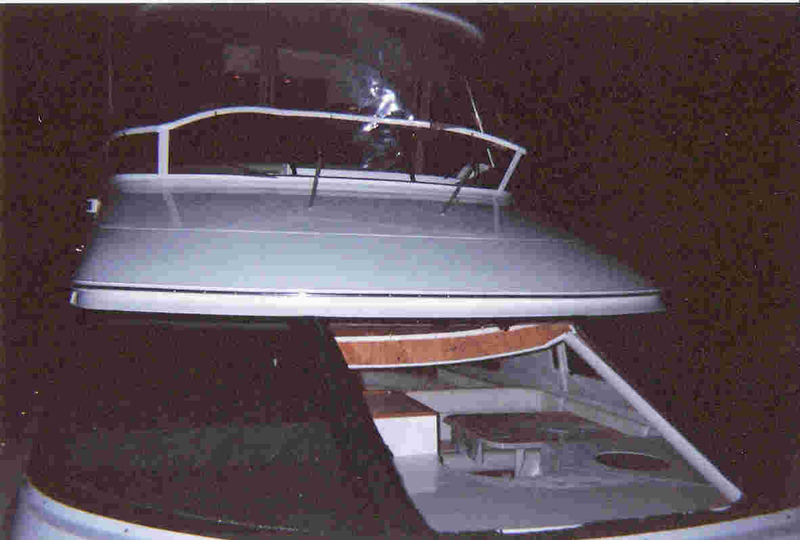 For instance, on a nice calm night running downwind, a serious wave wiped out the windshield and flybridge of this 56′ Sea Ray off the shore of Southern Oregon. It kind of messed up the cabin, too. But nobody died and we got a good story. Sorry there aren’t more pictures. The cameras got a little wet, and we were busy. But none of these boats can go far from land, and we want to go far from land. But we want windows. But Grownup Ocean Boats don’t have windows. 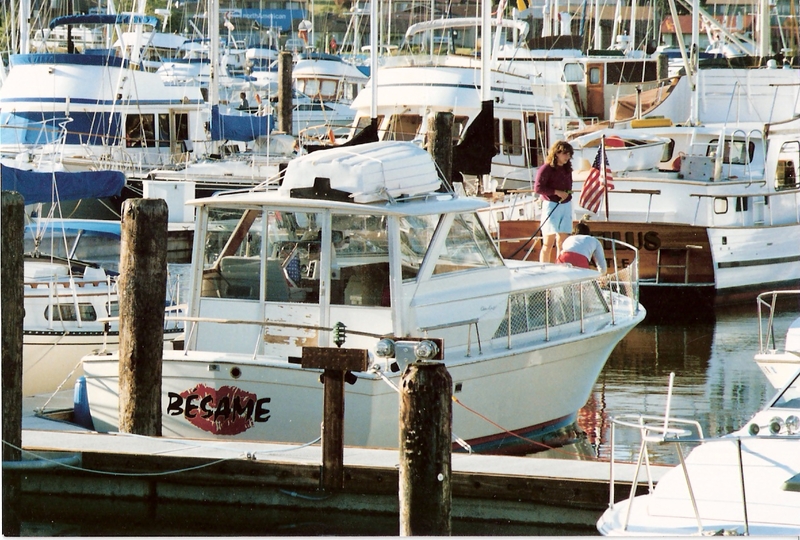 Then Nancy spotted a Cal 2-46 in a local harbor. A little research, a few phone calls, and we were aboard. We also learned that of the 95 boats of this type built, at least five have circumnavigated and many more have sailed to and from Hawaii. So Nancy got on the job. Harnessing the privacy-destroying power of the internet, we sent inquires to over half of the Cal 2-46 owners. We sent the inquires by USPS, instead of calling on the phone or sending emails so we didn’t freak anyone out any more than necessary. 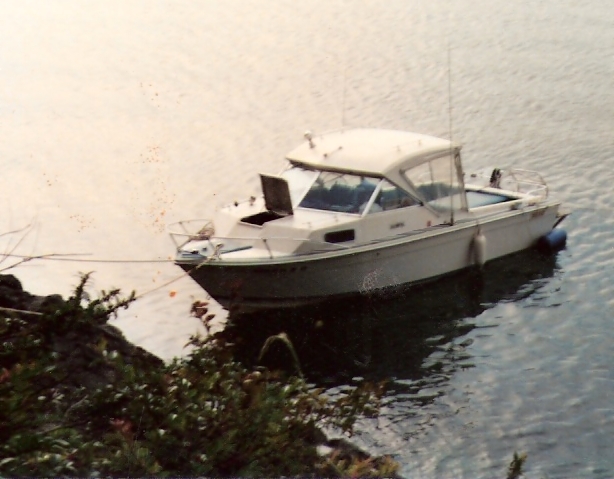 Even though none of the boats in the US was actively for sale, we found several people that were willing to sell their boat. We picked out this one. Federal Safety Standards and stuff. The man trying to shut us down, yo. Anybody want to see anything we haven’t talked about? Any followup needed? How about the sarcasm level? Should I turn it up? I know you all want more pictures of Nancy. Me too. Here you go. We had a sunny warm day here in Western Washington. That means that the high temp was over 70, the humidity fell below 50%, and the sun was out for at least half the day. 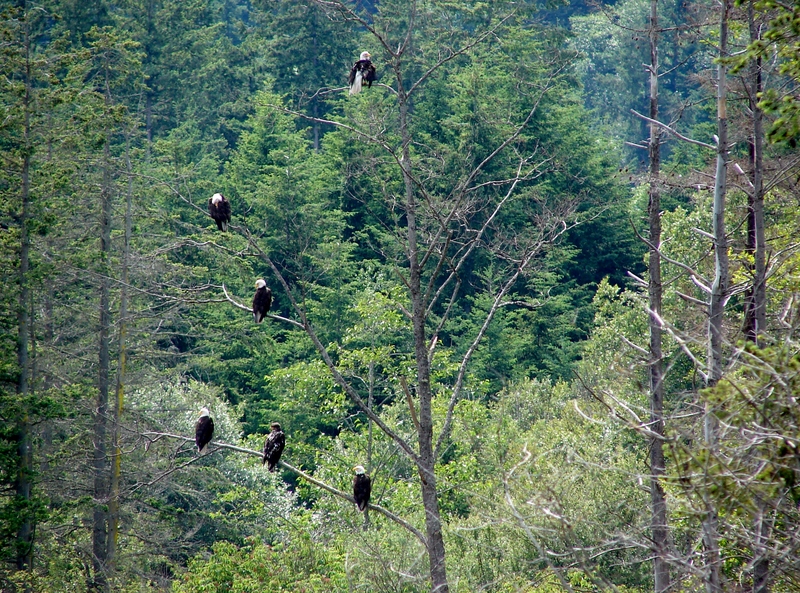 So we opened the Camano Island sail laundry (non-permitted). 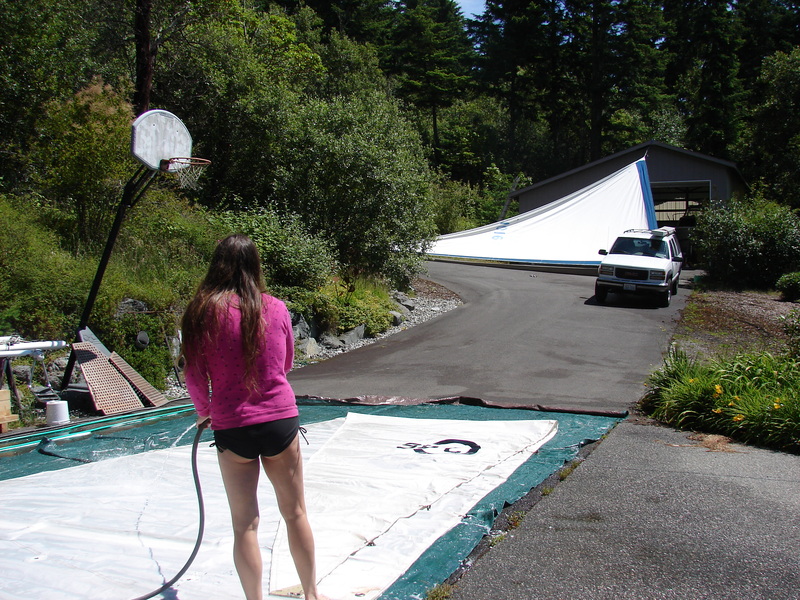 One good sized tarp, a dingy, and a little soap and water and we were in business. 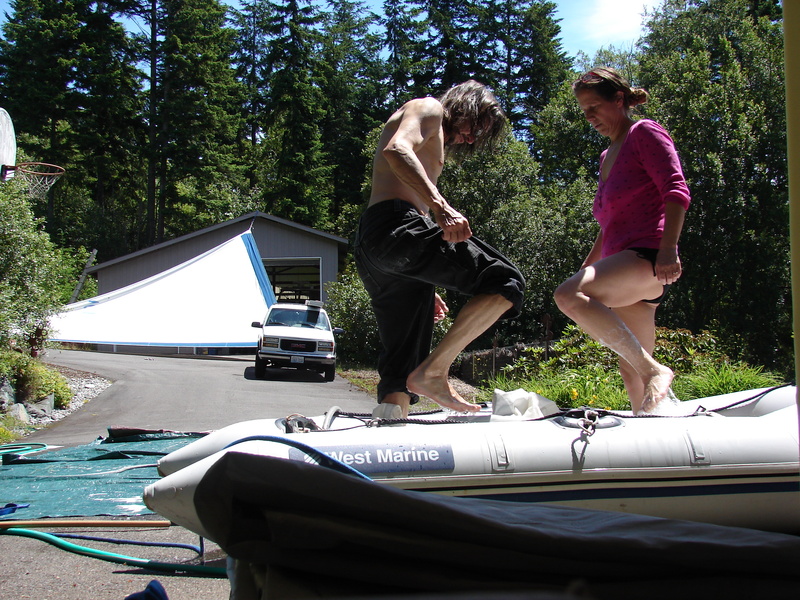 We scrubbed the jib, soaked it in the dingy, scrubbed it again, and then tied it to the Mermaid on the top of the barn, the Suburban, and the wagon. It was harder than you might think to get the whole thing off the ground. The main sail was a little more trouble. 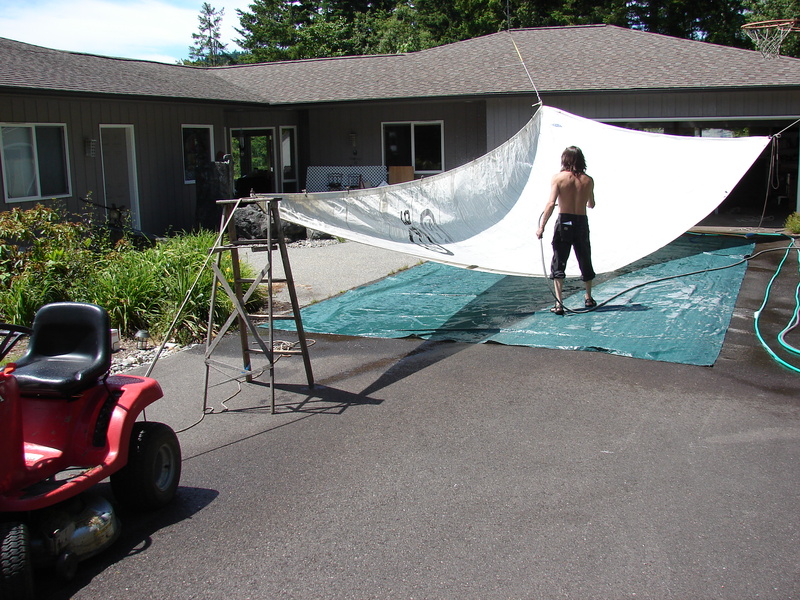 First we had to remove the battens, then we laid the sail out on a tarp and scrubbed the considerable stains. Seems the Sausalito Songbird Society had found a home in the sail for the past several years. 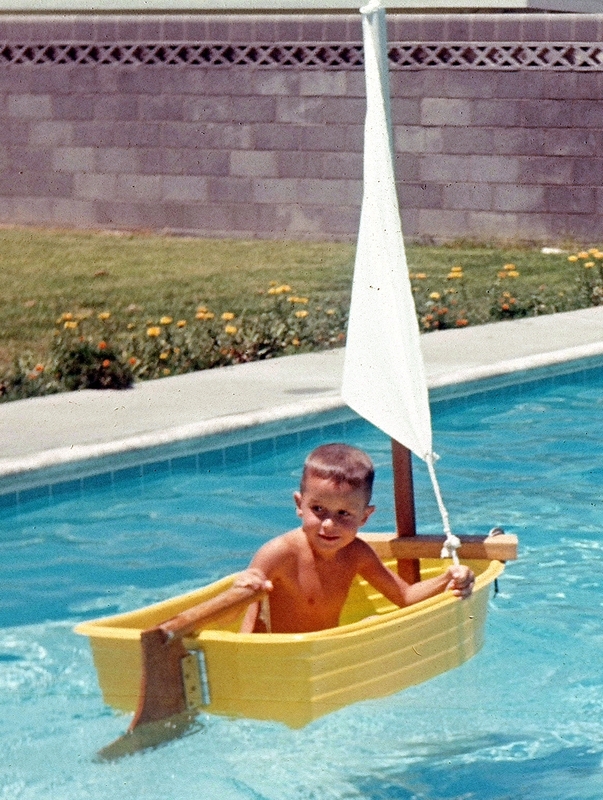 Then we pulled the whole thing into the dingy and soaked it in Woolite and Clorox all-fabric colorsafe bleach. It took a while to get it all underwater. A long soak, a quick rinse, and then it was time to string it up. 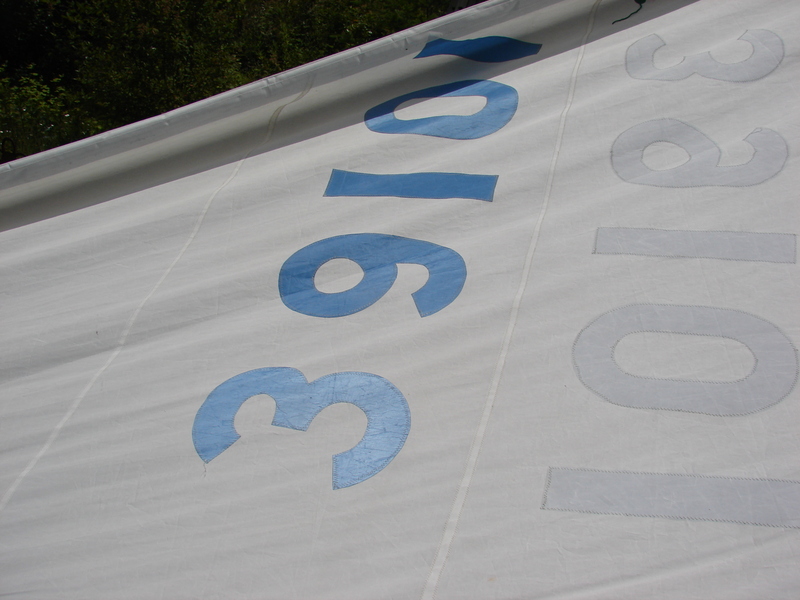 It took most of the day for the sails to dry, then we didn’t get them down quick enough. You know what that means. At least the blackberries aren’t ripe, and thankfully it wasn’t one of these fish processors. We had the jib (Genoa) repaired by a sail loft last month. I asked the guy how old the sail was. He pointed at the numbers. Then he had me look a little closer. Our numbers are stitched on. 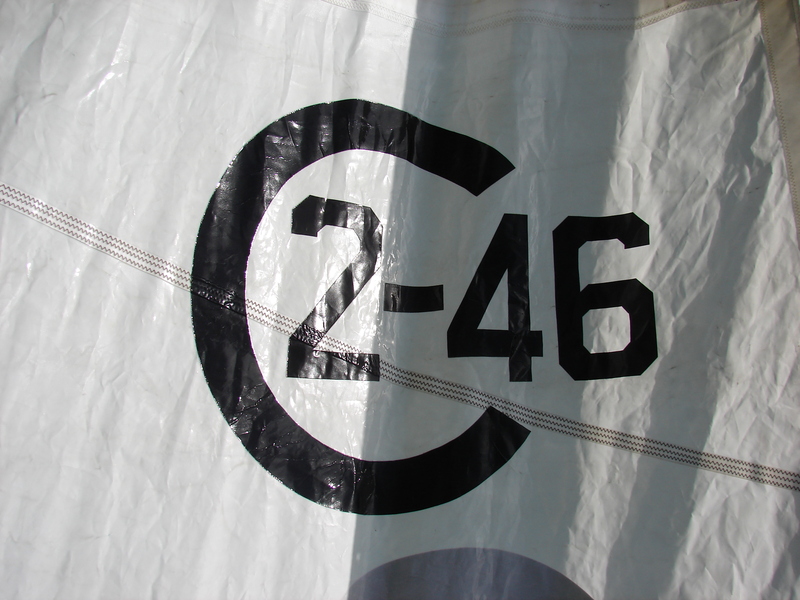 Modern sail numbers are cut from fancy fabric tape, and stuck on the sail, like the logo on our mainsail. It’s been that way since sticky-back fabric has been available. That means our jib is older than 3M. I wish I’d mounted the radios right on the battery.